There’s not a whole lot I can say about this dish but I wanted to share it as it has become a family regular. It’s quite simple but very tasty, fresh and healthy. I love Vietnamese food. There are 2 main steps but no need to wash the bowl in between. The chicken balls are prepared first and then cook in the soup! It’s become a bit of a case of Jack Spratt in our house where my daughter eats the chicken-balls and soup and my son eats the noodles, but together they lick the bowl clean. The recipe is HERE. For gluten free make sure you use a gluten free soy sauce. The trick is not to over process the chicken so that the chicken meatballs stay nice and light and tender. Only whizz it the minimum amount necessary to combine everything. Every time I make this I make the same 2 errors while ‘following’ the recipe. Without fail I put the garlic (meant for the soup), and both teaspoons of ginger (instead of just one) into the chicken mix. I then continue to add more garlic to the soup and another teaspoon of ginger. This doesn’t do it any harm so go for it. As per my tendency I also made a couple of deliberate changes, but only additions because I do like a good garnish. I used the varoma for the pak choy and steamed some extra vegetables – carrot slices, snow peas/mange tout, and baby corn. When I dished it up I added crunchy bean shoots, fresh coriander and crispy fried eschalots. I included a wedge of lemon as just about everything is better with a squeeze of lemon. Lastly, if you want to spice things up a bit, a splash of Vietnamese chilli sauce doesn’t go astray. The only negative is that the noodles do tend to get wrapped up around the blades (though they don’t get chopped up). If anyone can work out a solution for this please tell me! What do you know? Apparently I did have a lot to say! 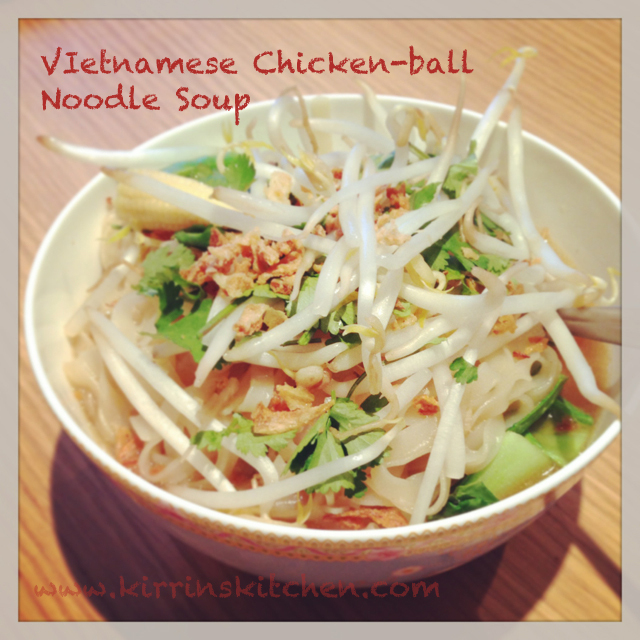 This entry was posted in Mains, Recipes and tagged Chicken, dairy free, gluten free, recipe, Soup, Thermomix, Vietnamese. Bookmark the permalink. « Asparagus Risotto, yet another crisis averted.